We're having a lovely day. We grilled steaks and had baked potatoes, yeast rolls, salad and homemade banana pudding. Yum. 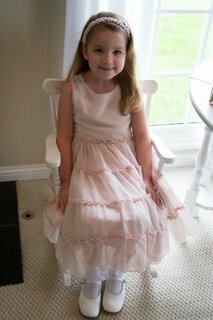 Caroline looks like an angel in her Easter dress. 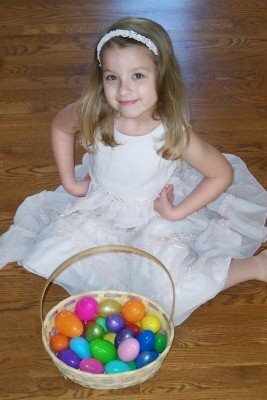 We had an indoor egg hunt because we had a light rain that made the grass wet! We really hid them well and she enjoyed actually hunting for them instead of just picking them up everywhere. Then we sat and watched almost a whole tape from our video camera. It started when she was 4 on Christmas and ended today. Her tiny voice at 4 made me cry!! I love watching videos. 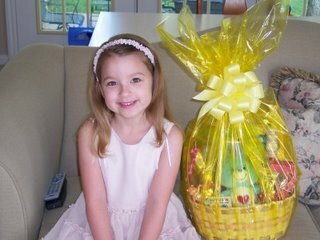 Here she is with her Easter basket made by Mommy: Swift Heart Rabbit (I found this at Walgreens for $5.99 on a reissue but I almost paid $50 on Ebay last Christmas! Whew!) - chocolate bunny of course - mucho candy - a Rankin/Bass Easter Bunny DVD (it's great) - my favorite little kid game, Trouble and more! Here she is after our indoor egg hunt. This dress is maybe my favorite she's ever had. The photo doesn't do it justice. It's a pale dusty rose color and it just compliments her skin tone perfectly. I have been so in love with her today. Hope you had a happy Easter! God bless you! How precious! Those pictures are great! Caroline does look like an angel! You can see she is loved and content with her life. That's too bad you didn't get to hunt eggs outside. We had a little sprinkle here but it was dried up by the time we got through eating. She does look like an angel! Gorgeous! She really is such a beautiful girl and you captured her very nicely in these pictures.